CODE: CTT 004 CHIANG MAI TREKKING TOUR WHITE WATER RAFTING (MAETAENG AREA)FUN WITH NATURAL SCENERY : Paddle through breathtaking canyon for unparalleled fun on the river.Tang, winding river flowing. Code : CODE: CTT 001 CHIANG MAI TREKKING TOUR (JOIN GROUP TOUR) ONE DAY TREK (MAEWANG AREA) Elephant riding 1h, Rubber boat ride 1h, Bamboo rafting 1h, Waterfall ,Jungle walks of 1h. You will have a little time to look around the elephant camp while the mahouts prepare the elephants for the ride. 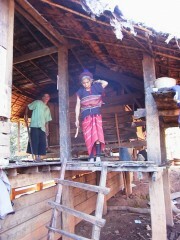 After the ride you will drive to a Karen hilltribe village (20 min.). An elder hill-tribe woman of the Karen tribe. Thai people call them dirty people. Also you can buy hand-woven fabrics and other souvenirs made in the village. The guide will lead a tour through the village for about half an hour. 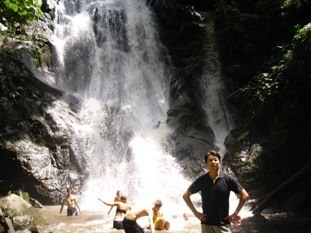 The beautiful Moradok Falls on our elephant trekkingbamboo rafting day. From there you will make a jungle walk for about 30 min. To "Huey Nam Rin" village, a village of the "Meo" tribe. The guide will lead a tour through the village for about half an hour. 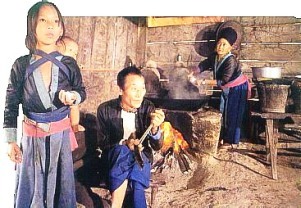 From the "Meo" village we will drive to a "Shan" village where we will have lunch. The ride will take about 1.5 hours. We do this adventure trek every day. The form does not show any discounts, we will confirm the actual price in the return Email. Children up to 10 years old 60% of adult price. On a "joint trek" you will join with others (8 - 10 persons). 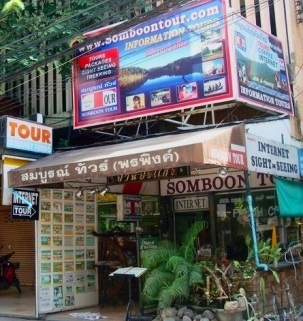 Itinerary 8:00 - 9:00 a.m. : Pick-up from hotel or guest-house Transfer by local truck. We will leave Chiang Mai on highway 108 past the airport to Sanphathong, and further to "Mae Wang Elephant Camp", an about 1h drive. You will have a little time to look around the elephant camp while the mahouts prepare the elephants for the ride. 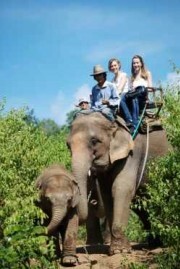 The elephant ride will lead you through a wonderful mountainous jungle landscape for about 1 hour. After the ride we will drive to the raft landing. 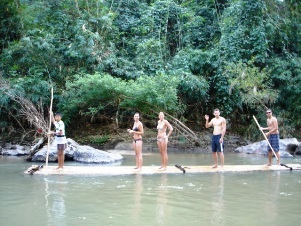 From here you can make an exiting ride down "Mae Wang" stream on a raft made of bamboo stems bound together. The ride will take about 1 hour. From the there we will drive to a "Shan" village where we will have lunch. After lunch we will drive to a "Karen" hill-tribe village. There you can watch "Karen" women weaving on hand-looms and you will get some insides into the living of the "Karen" people. Also you can buy hand-woven fabrics and other souvenirs made in the village. The guide will lead a tour through the village for about half an hour. From there we will drive to the "Mae Wang" falls, where we will make a brake. You can swim there, walk around or just relax. 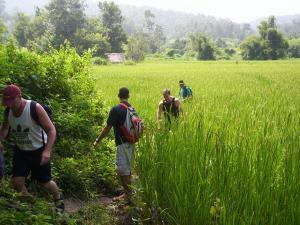 Here we start our jungle walk to "Ban Pha Daeng" village, a village of the "Meo" tribe. The guide will lead a tour through the village for about half an hour. After that back to Chiang Mai where you will arrive at about 17:00h. "You through a wonderful mountainous jungle land scape". Note : Respect The Beliefs. Customs. And Religious Symbols And Structures Of Any Hilltribe Village You Visit Please Ask Our Guide. Remarks : All Time In Programs Above Are Approximat Only They Are Able To Be Shortened Depending Upon Each Situation. • Price includes roundtrip transfer for guests who stay at hotels in Chiang Mai City. Itinerary 8:00 - 9:00 a.m. : Pick-up from hotel or guest-house Transfer by local truck. Back to Chiang Mai where you will arrive at about 17:00h.